Bernadette Fox has disappeared. Everyone assumes she is dead, or gone for good. But her fifteen-year-old daughter, Bee, is determined to do everything she can to find her. Over an eclectic collection of notes, letters, private emails, articles, blog posts and reports, we gradually gain a unique insight into all of the characters, their motivations and their emotions. These are interspersed with commentary from Bee, as she attempts to piece everything together. 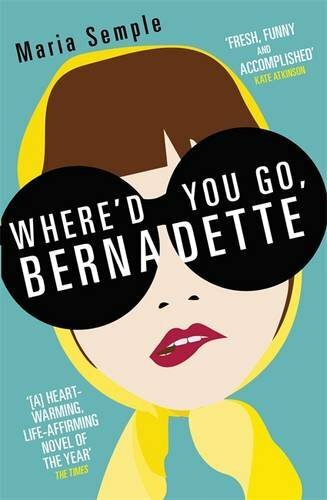 These all come together to form a bigger picture of the string of events that took place in the run-up to Bernadette’s disappearance, and to help us – and Bee – solve the mystery as to where she is now. The format of the book is really interesting. It’s quite hard to describe the plot for this exact reason. It didn’t feel as if I was reading a story, instead, it felt like I was piecing together a case and a narrative from the raw material. Only in this case, the raw material is incredibly witty and expertly crafted to give away just the right information at any given point in time. Each character has their own voice, and this voice is real, rounded and completely convincing. I think one of the real skills on display here is the author’s ability is to flit from character to character, switching between different perspectives from page to page. The overall narrator, Bee, is strong willed, independent and funny, and her mother is wonderfully eccentric and entertaining. I wanted to know them. The story does veer into the ridiculous at some points, but this only adds to the overall charm of the book and it somehow manages to also stay believable. It’s been a while since I enjoyed a book as much as I enjoyed this, and I wouldn’t hesitate to recommend it. This entry was posted in Literary and tagged book review, fiction, Maria Semple. Bookmark the permalink.